According to a media report, Nissan has revealed that it plans to launch the Leaf electric vehicle (EV) in India later this year. The company has said that the Leaf will be launched in metro cities only. It will be aimed at institutions and government agencies as well as some influencers, since higher costs would make it unfeasible for the mass market. However, the company plans to invest in India in order to bring the costs down. 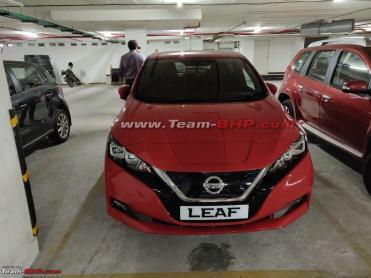 The second-generation Leaf EV has already been spotted testing in India. The car uses an AC synchronous electric motor that produces 148 BHP @ 3,283-9,795 rpm and 320 Nm of torque @ 3,283 rpm. It comes fitted with a 350 V, 40 kWh lithium-ion battery that has a claimed range of 378 km on a single charge. In addition to the Leaf EV, Nissan is planning to bring other electric vehicles from its global portfolio to India in the future. 60:40 rear seat or 40:60?